BuzzFeed's 'K-File': Why Campaigns Should Fear These Four 20-Somethings Even before he became "BuzzFeed Andrew," Andrew Kaczynski spent hours a day scouring archives for political research. Now the 26-year-old leads a team bringing controversies and scoops to the public. BuzzFeed's K-File (from left: Andrew Kaczynski, Nathan McDermott, Megan Apper and Chris Massie) has been covering the 2016 election by revealing the candidates' contradictions, hypocrises and misstatements. For more than a generation, politicians have been on notice that political opponents would hold them accountable through deep dives into their records — a practice called oppo research. This election cycle, candidates for the White House also have found themselves trying to dodge a buzz saw: BuzzFeed. Andrew Kaczynski, 26, runs a political research unit for the news organization, scouring the historical record to unearth buried stances taken by leading candidates. A surprising number of the controversies and scoops that surface in televised debates and interviews started with Kaczynski's four-person team, called the K-File. They pointed out Hillary Clinton's error when she asserted that all four of her grandparents were immigrants. They found the video where Ben Carson said he thought the pyramids were built to store grain. They watched enough video (an estimated 3,000 hours overall) to know that Donald Trump's claims of consistently opposing the U.S. invasion of Iraq are not supported by the record. 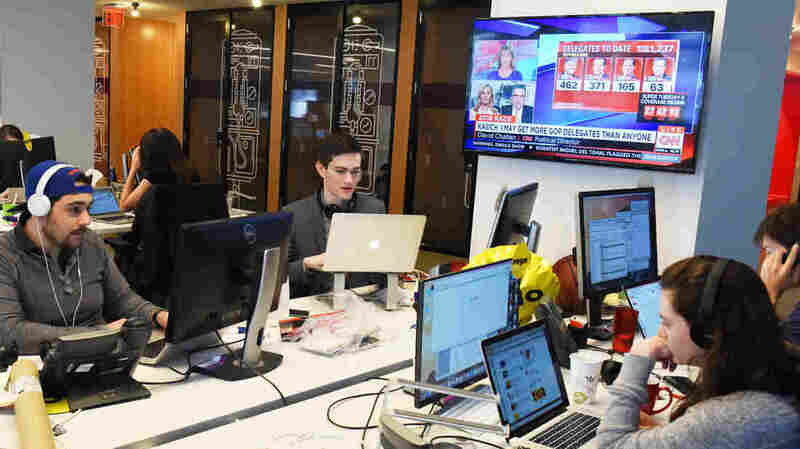 BuzzFeed has grown past its roots as a viral site focused on lists and GIFs, and has earned credibility among more traditional journalists with some strong reporting from the campaign trail. Now BuzzFeed is offering a new multimedia form of accountability journalism: repeatedly revealing the candidates' contradictions, hypocrisies, misstatements — and, at times, flat-out weirdness. "To, like, truly understand who these people are, you have to, like, absorb all of their information from their life," Kaczynski says. Hillary Clinton delivers a speech where she referred to certain children as "superpredators" on Jan. 28, 1996. Watch the full speech here. In recent months, the K-File team has been able to direct the attention of campaigns and the press toward various overlooked facets of candidates' histories. For example, they found a 1996 clip where Hillary Clinton referred to certain children as "superpredators." The team also unearthed a 1985 video clip in which Bernie Sanders proclaimed admiration for Sandinista leaders in Nicaragua and Fidel Castro's regime in Cuba. This isn't the first time that Kaczynski's finds have changed the election game. Kaczynski has been honing his digging skills since the 2012 election cycle, when he was a student at St. John's University in the New York City borough of Queens. New to the city and living alone in a Russian family's basement, he spent hours watching old footage of Mitt Romney, picking out clips in an effort to discern who the presidential candidate really was. Mitt Romney campaigns in Massachusetts in 1994. Watch the full video from BuzzFeed here. Kaczynski found videotape of Romney from years earlier, calling himself a progressive while appealing to Massachusetts voters. He slapped it up on YouTube and tweeted out a link, and soon enough saw citations of it in mainstream media coverage. This year, Romney instead benefited from Kaczynski's work, referencing research by the BuzzFeed team several times in his recent anti-Trump speech. Trump also spent days fielding pointed questions after Kaczynski found two instances of former Ku Klux Klan leader David Duke calling for followers to support Trump's candidacy. And the K-File team made a meal of Ben Carson, in one instance unearthing this from a commencement address in 1998: "My own personal theory," he said, "is that Joseph built the pyramids in order to store grain; now all the archaeologists think that they were made for the pharaohs' graves ... "
Kaczynski and his team's findings drove both critical and supportive headlines about Carson: In one case, BuzzFeed found evidence supporting much of his account of moral righteousness at Yale, which had been receiving skeptical coverage. Other news organizations are jumping on his leads. CNN's Don Lemon, for instance, quizzed Clinton on that "superpredators" quote during a recent Democratic debate. "I think it was a poor choice of words," Clinton replied. "I never used it before, I haven't used it since, I would not use it again." Katherine Miller, BuzzFeed's political editor, says the dynamic amounts to a one-two punch of old media and new. "Having it appear on CNN is a good thing," she says. "We don't have access to Donald Trump, we can't get into his events, we don't have press access to him — so we can't grill him on any particular issue." "Sometimes politicians do, like, generally change their opinions on things, and there have been, like, they've moved with the times," he says. "But other times, like, it just comes off as so cynical and political that it can be somewhat disheartening."